Overcrowding in a line up and what you can do about it! Overcrowding bothers some handlers more than others. Handlers can become quite frustrated when confronted by competitors who overcrowd their dogs in a stacked line up. By overcrowding, I refer to situations where the competitor behind one dog stacks their dog in very close proximity to the dog in front. In many situations, overcrowding can occur quite innocently. In other situations, it can show a lack of respect or knowledge about ring etiquette. In some situations, it can even be applied as a deliberate tactic to intimidate other exhibitors and even to confuse or pressure a judge when making their final decision. avoid unnecessary confrontations with other exhibitors. When you’re first in the ring and the competitor behind you stacks their dog too close to yours, don’t panic. Simply start stacking your dog, which, if you follow my technique should only take a few seconds. 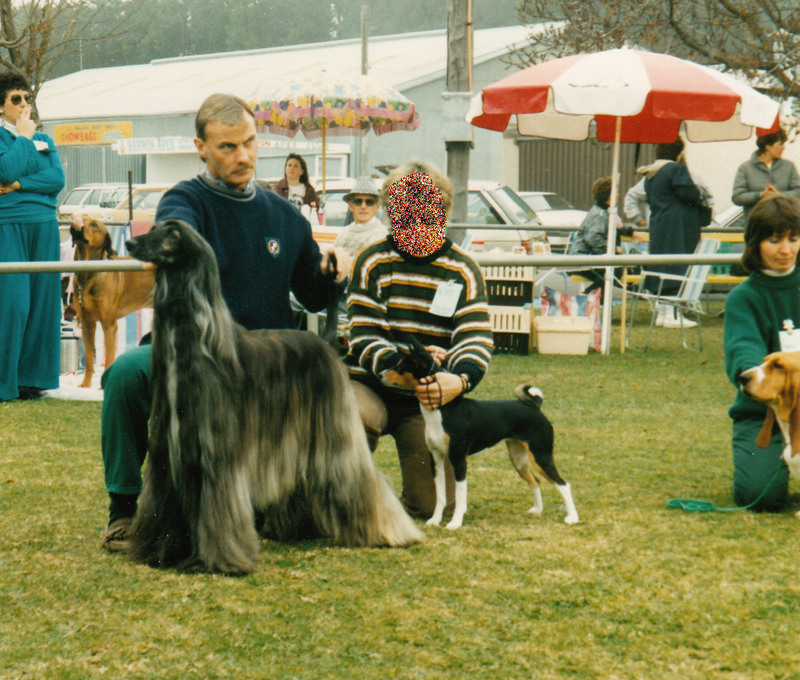 You can then wait for the competitor behind you to start stacking their dog. If they start to do this too close behind you, simply move forward so there’s about a three-foot (90 centimetre) distance between you and the next dog, and then re-stack your dog. If your stacking skills are up to scratch, then you should be able to complete a second stack before your competitor has even finished their first. However, if you should find (with human nature being what it is sometimes) that the competitor behind you gives up stacking their dog and moves closer to you and starts stacking their dog again, simply stand your ground and trust that this won’t go unnoticed by the impatient eye of the waiting judge (who, in my experience, dislike overcrowding nearly as much as handlers do). If you have a dog in front of you and another dog close behind, good stacking skills can also help you prevent overcrowding and empower you to manage the vagaries of a stacked line-up to your advantage. For example, when the dog in front of you stops, use a calming sound to indicate to your dog that they should watch you as you slow down and come to a halt about six feet (two meters) away from the dog in front. As I will explain next, doing this will help you prevent overcrowding from any dog coming up behind. By allowing extra space before you come to a stop from the dog in front of you, you can stay cool and wait for the exhibitor behind you to stop and start stacking their dog. Once they start to do this, you can move your dog up to three feet (90 centimetres) away from the dog in front of you and complete your stack all the while guaranteeing a good space behind you and the next dog in the line-up. By doing this, less experienced or more aggressive competitors will be less likely to sacrifice the time that they’ve already put into their stack to move forward and overcrowd you. Whatever the situation or cause that leads to the overcrowding of your dog may be, I strongly recommend against arguing with the handler responsible for doing it while you’re in the ring. Not only can asking the overcrowding handler to ‘stop’ what they’re doing be fraught with physical danger (and yes, it’s been known to happen), it’s also unnecessary if you use the handling techniques that I’ve set out above. It’s also an unsightly display of poor sportsmanship, which may not only attract negative attention from the judge, but may also attract unwanted commentary from ringside spectators who may or may not have a full understanding of the situation. The fact is, some overcrowding is intentionally designed to pressure competitors and judges, while some overcrowding is the unintentional result of sharing a show ring with less experience competitors. Either way, my show ring philosophy is about controlling what you can and not worrying about what you can’t. The minutes you might spend worrying about why you’ve ben overcrowded could be better spent in a few seconds addressing the problem at hand, i.e. demonstrating to the judge why your dog is more worthy of a particular award than any other dog that’s also on show. Finally, as a last resort, should the above techniques not work to your advantage and you’re still being routinely overcrowded by a particular competitor; notify the ring Steward and ask for their assistance in keeping an eye on the perpetrator in a loud enough voice so that the offending handler hears you. Believe it or not, if the overcrowding is deliberate, then you’ll never have the problem occur again. ← Dogs action not important – your reaction is everything.